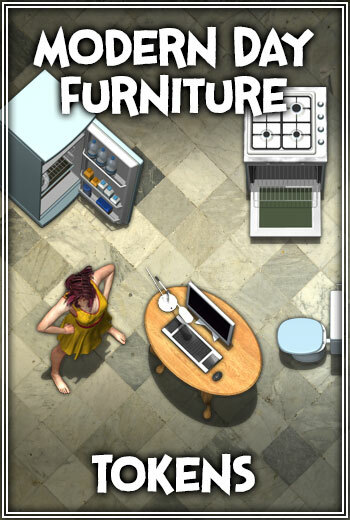 This token pack aims to give Game Masters access to a standard range of furniture that can be used to flesh out a wide range of Modern settings, such as a heroes home, villan’s hide out, evil corporations offices, or even the local pub. 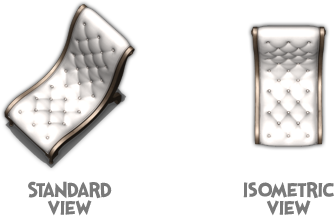 Each token set (also called a character set for character tokens) contains the object rendered from an offset top down view with the object turned 45 degrees between each render. Some sets do not have each angle rendered because the object looks the same reguardless of which side has been rendered. Character sets are rendered differently to object sets, being that the character is rendered in a variety of action poses, instead of being turned around between each rendering. Each token set depicts an object from a slightly offset top down perspective – this is done to create the appearance of “depth and detail” for the object/character. To complement this, some sets include what we call an “isometric” token that was rendered from a top down view, without any offset. IMPORTANT: This token and map pack is for use with programs such as Fantasy Grounds II, Battlegrounds, or Roll20. This is not a stand alone game, but a gaming aid for use in virtual tabletop role-playing software.